More than 20 percent of the Neanderthal genome survives in the DNA of a group of 665 people, a UW analysis shows. A substantial fraction of the Neanderthal genome persists in modern human populations. A new approach applied to analyzing whole-genome sequences data from 665 people from Europe and East Asia shows that more than 20 percent of the Neanderthal genome survives in the DNA of this contemporary group, whose genetic information is part of the 1,000 Genomes Project. Previous research proposes that someone of non-African descent may have inherited approximately 1 percent to 3 percent of his or her genome from Neanderthal ancestors. These archaic DNA sequences can vary from one person to another and were aggregated in the present study to determine the extent of the Neanderthal genome remaining in the study group as a whole. The findings are a start to identifying the location of specific pieces of Neanderthal DNA in modern humans and a beginning to creating a collection of Neanderthal lineages surviving in present-day human populations. Joshua Akey, left, a UW genome sciences researcher, discusses models of evolution of human-like species and humans with his graduate student, Benjamin Vernot. To check the accuracy of their approach, Vernot ran their analysis before comparing the suspected Neanderthal sequences they found in modern humans to the recently mapped Neanderthal genome obtained from DNA recovered from bone. This genome came from the paleogenetics laboratory of Svante Paabo of the Max Planck Institute for Evolutionary Anthropology in Germany. The results suggest that significant amounts of population-level DNA sequences might be obtained from extinct groups even in the absence of fossilized remains, because these ancient sequences might have been inherited by other individuals from whom scientists can gather genomic data, according to Akey. Therein lies the potential to discover and characterize previously unknown archaic humans that bred with early humans. “In the future, I think scientists will be able to identify DNA from other extinct hominin, just by analyzing modern human genomes,” Vernot said. 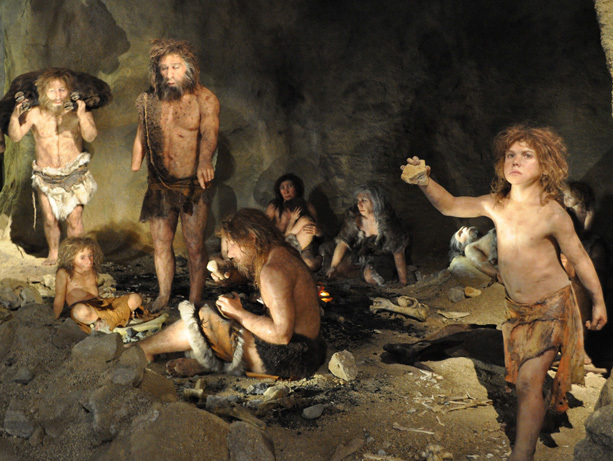 Neanderthals became extinct about 30,000 years ago. Their time on the earth, and some of their geographic range, overlapped with humans who anatomically resembled us. The two closely related groups mated and produced some fertile offspring, such that portions of Neanderthal DNA were passed along to the next generations. In a proposed model, this mixing of DNA could have occurred both before and after the evolutionary divergence of non-African modern humans from a common ancestral population. It didn’t necessarily take a lot of individual hybrid offspring to introduce Neanderthal genes into early human populations. Still, Akey said that it isn’t known how many Neanderthal ancestors present-day humans have. But past interactions between the groups, Akey noted, is probably more complicated than previously thought. “In addition, the analysis of surviving archaic lineages points to the possibility that there were fitness costs to the hybridization of Neanderthal and humans,” Akey said. Nevertheless, the Neanderthals were also a probable source for at least a few genetic variations that were adaptive for their human descendants. Neanderthal DNA sequences are found in regions of the genome that have been linked to the regulation of skin pigmentation. The acquisition of these variants by mating with the Neanderthals may have proven to be a rapid way for humans to adapt to local conditions. The researchers observed that certain chromosomes arms in humans are tellingly devoid of Neanderthal DNA sequences, perhaps due to mismatches between the two species along certain portions of their genetic materials. For example, they noticed a strong depletion of Neanderthal DNA in a region of human genomes that contains a gene for a factor thought to play an important role in human speech and language. According to the scientists, the “fossil free” method of sequencing archaic genomes not only holds promise in revealing aspects of the evolution of now-extinct archaic humans and their characteristic population genetics, it also might provide insights into how interbreeding influenced current patterns of human diversity. Additionally, such studies might also help researchers hone in on genetic changes not found in any other species, and learn if these changes helped endow early people with uniquely human attributes.